At Last here are my photos from Iran. I have been so busy since I have got back home. I am starting with a selection from Tehran. Despite the first photo, I arrived here on Emirates from Dubai. 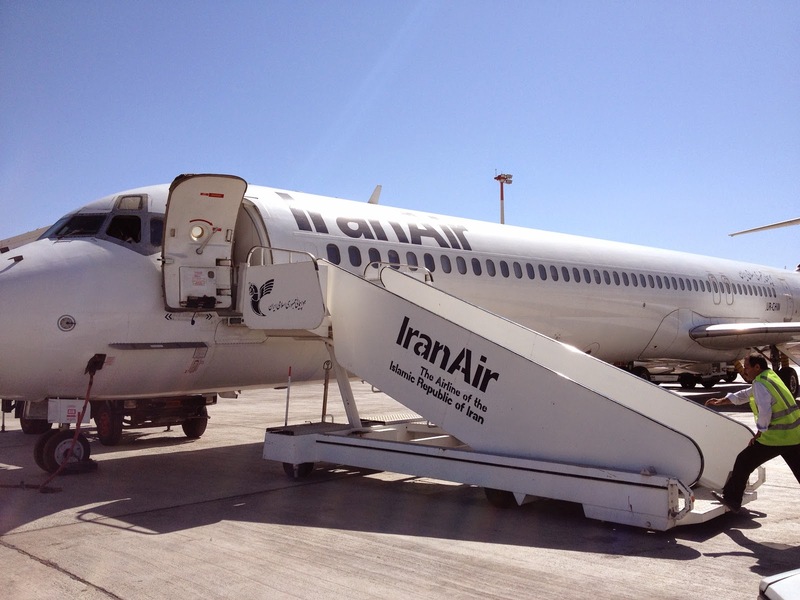 The Iran Air plane was the flight I took to Yazd from Tehran. This is my third time here and I love the place. The Iranians are so friendly and not at all like the other Arab countries in this area. Of course they are Persians and not Arabs. I had organised a group with me so our first visit as it happens was to the Den of Espionage or The old American Embassy. You need permission to go here as normally off limits. So the next photos are off the Embassy and we got a full tour. My American friend Bill from Seattle on the tour was pretty amazed what he seen . Asked could he take photos the Guide said "Yes of course it is your home" . On the first night we all had dinner with my good friends from Tehran. Ali was my original taxi driver who brought me everywhere on my first trip here in 2001. Here is a typical Persian restaurant. They even had a Irish flag ready for us. A great finish to our first day in Iran. Well this is my final set of photos from Iraq. From the Bottom up we have the Local Chief of a village. His wife was American but they lived here in Iraq and he had perfect english. So great to talk to him and get a feel for what was going on. I am at a table with on my last night in Baghdad with some locals. In this restaurant you could drink, but I stayed on soft drinks. Still they were very interested to talk to a "tourist". There was a piano player from Armenia and being Irish I took to the microphone and sang a song. Fitting for my last night. It sent everyone away in good spirits. There is a monument in Baghdad to commemorate the revolution in 1958 . 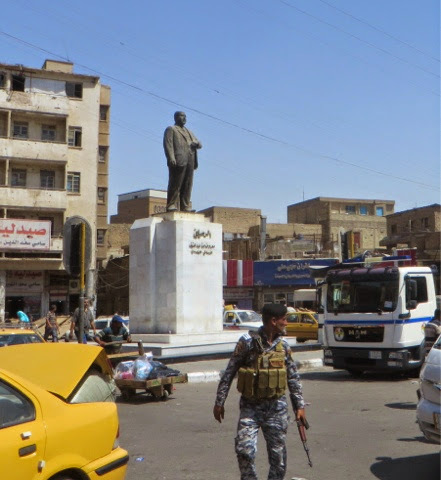 Another monument that I am not sure , what it is , but it is in Baghdad. 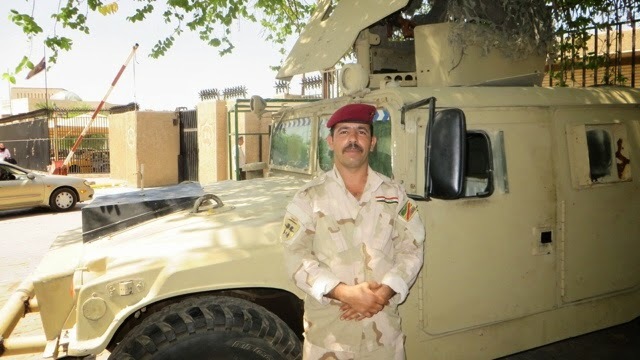 And finally some of the Iraqi Army VIP service who provided security during the trip. Overall a very difficult country to travel in at present , but the people on a face to face level are great to talk to . I look forward to the day that Iraq is at peace with the world and itself. 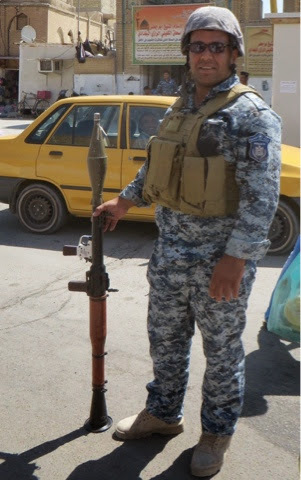 Kerbala is a holy city and security was heavy heavy here. No cars allowed in the centre or near the mosque. This is a car bomb that went off in Kerbala the day I was here. No one injured. Imam Husayn Shrine is one of the oldest mosques in the world and holy site of Shia islam. It is a very busy mosque and many millions visit from all over the world. Inside got a special VIP tour so was able to take these photos. Amazing to visit. On the way out of the city found this post office. A yellow box and closed.. Wish I had put a card in a box to see if it would go. I am home back in Dublin now after this trip. So at least I can put up some more of the photos and details of the trip. 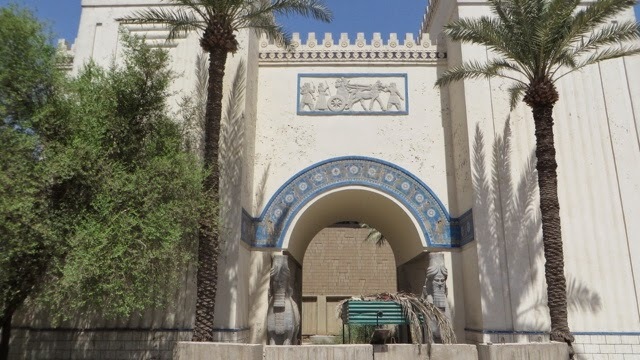 This is copy of the entrance Gate to Babylon. The original is in a museum in Berlin. 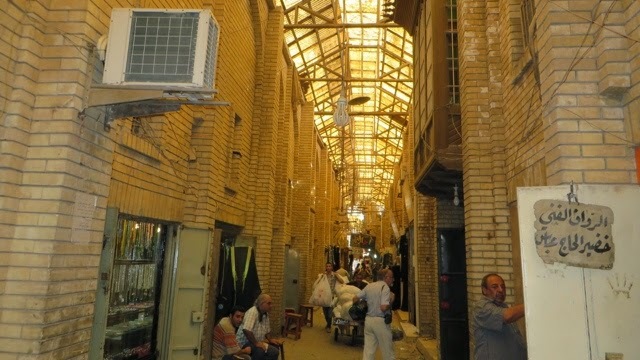 The other photos include part of the restoration of Babylon which was done under Sadam. Finally some photos from the old nearby palace that once belonged to Sadam. It was interesting going inside . It was for a time used as a basketball court by the local soldiers in recent times. Now left in disuse. Was told by the Iraqi Tourists officials that at one stage it was looked at in recent years as a possible 5 star hotel for Babylon. Long since gone into non use . This was the Sovenir shop and even a post box outside. Now it is a sleeping area for the local security and army. There was no post box or Post office in this area. Even if there was I would not have found it as all the contacts I had decided to deny that a Post office existed and was always directed to DHL or whatever. Very frustrating. 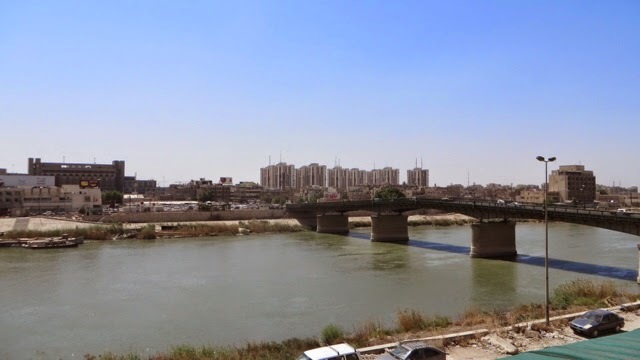 Day 3 in Baghdad. 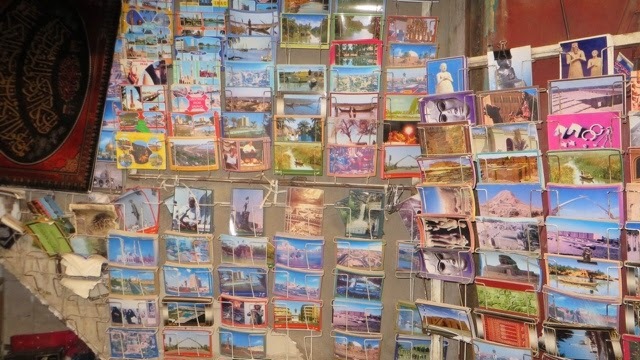 More photos of the postcards on sale. 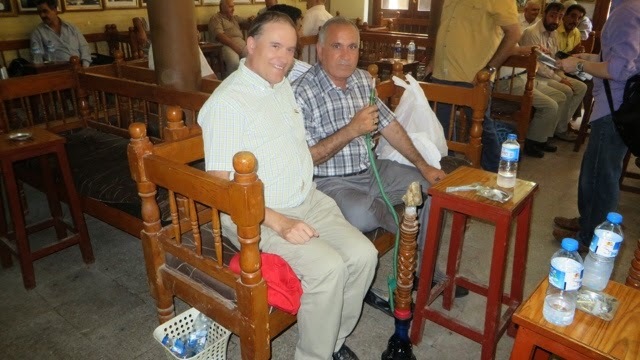 A famous cafe in Central Baghdad to sit relax and talk with the locals. Not permitted to take photos at checkpoints but with some Irish charm , managed to talk them into the idea !! 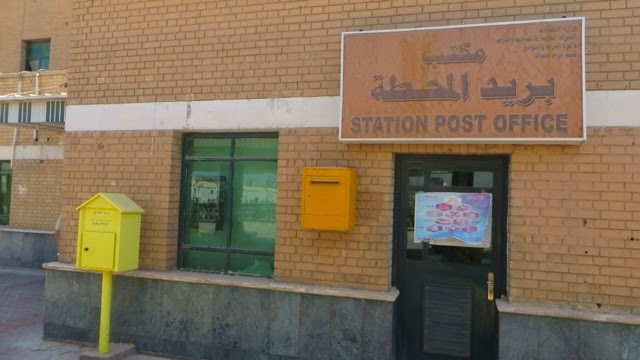 Here is the Post Office at Baghdad Central Train Station. I did not post any postcards here, though maybe in hindsight that mind have been a good idea. I did go to the main Post Office. It is heavenly guarded and so no photos. It was difficult to get permission to go and I was told it was closed at the time I was going. But I persisted and my guides and security finally agreed. It was open and quite large. I ended up in the sorting office first. The Iraqi tourist board I was with did not know where to go as they had never been before. I finally found the office itself. There was no philatelic section I could see but did not do my normal checking. I was under extreme pressure to leave by the Iraqi tourist people. I did manage to send out postcards. In the middle of all this going on the power went and we were all in the dark. So I could not see correctly to finish off writing. 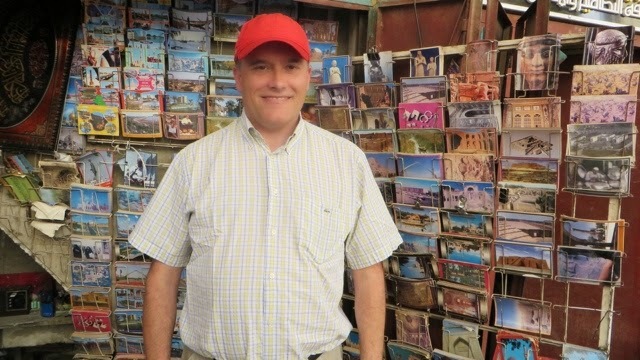 So for those who get a postcard from Baghdad it will have just your name and no writing from me on the left. So just presume it's from me. I have no photos either as the person taking the photos for me pressed the wrong button on the camera and no photos were taken. Still it was an experience. 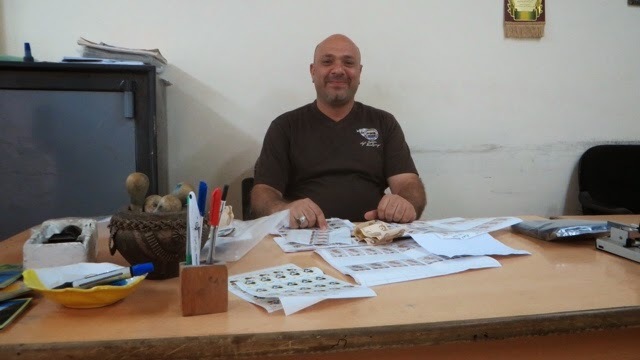 Getting to Post offices in Iraq is near impossible. All I get told is A-no Post office, B it's closed now, C it closed last month. I am now in Kabala , south of Baghdad. Tomorrow I will try to find the post office. Hi All. Had a great trip to Iran and will report on that when I get home next week. Had no access to any blogs there. So now in Baghdad. 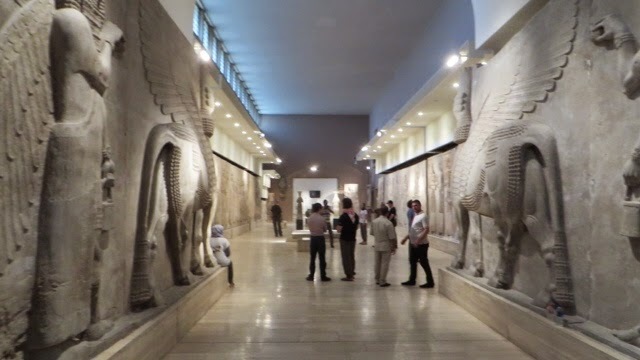 Here is day one with some pics of the National Museum in Baghdad. Much better then I had expected. 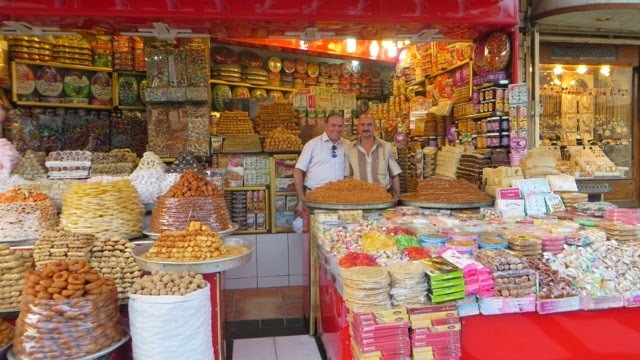 And some street scenes at a sweet shop and the only postcard seller I could find in Baghdad with a fab collection of postcards. Most from the 1980s. More to follow.